Create your UFS account and get 50 UFS Online Reward points! Create an account and get 50 bonus points! Achieving umaminess for my dishes is important and it requires the right balance of salty and meaty note. 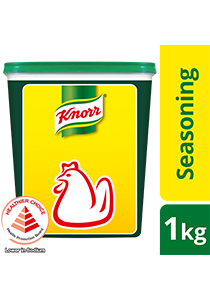 Knorr Chicken Seasoning Powder is a superior and trusted seasoning that elevates the natural flavour and aroma in any dish. All food additives used are from plant, animal and synthetic origin. May contain traces of cereal containing gluten, fish, milk, crustacean, mollusc, peanut and tree nut. *25% lower in sodium as compared to regular soup and broth. With an improved formulation using quality real chicken meat, Knorr Chicken Seasoning Powder gives 42% more chicken taste* and aroma to better enhance the taste of your dishes. Perfect for use in stir-fry, soup, sauce or marinade applications to deliver well-balanced chicken umami and aroma. For Stock: Dissolve 12g of Knorr Chicken Seasoning Powder in 1L of boiling water. For Stir-Fry & Marinade: Add 15g of Knorr Chicken Seasoning Powder to 1kg of meat, vegetables or cooked rice. Close pack tightly and store in a cool and dry place.